A big gap separates the abiotic and biotic evolutionary sciences. Abiotic evolution describes how the universe developed from a minute, hot origin to an incredibly large space with myriads of galaxies. Biotic evolution deals with life, ranging from bacteria, to plants and animals. To close this gap a theory is needed that focuses on the evolution of particles of variable complexity. Von Bertalanffy (1950, 1968) proposed a general system theory. He visualized the linking of many different disciplines. He argued that no strict rules had been formulated for organizing systems in a hierarchical way but, that when these would be found, such a ‘…general theory of hierarchic order obviously will be a mainstay of general systems theory’. Teilhard de Chardin (1969) distinguished ‘true’ natural units from 'pseudo units'. This French archeologist focused on the process of building block creation via emergent properties. He called the core of his theory ‘complexification intériorisante’, or inward complexification. Teilhard regarded the structural hierarchy he created when ranking atoms, molecules, cells etc. as a representation of the evolution of the universe (Teilhard de Chardin, 1966). Much of his thinking and writing served a religious purpose. For this reason many present day scientists have not discovered the value of his underlying system ideas. Simon (1962 demonstrated the functional advantage of modularity. He introduced the watchmakers Hora and Tempus, assembling watches of 100 pieces. Tempus When disturbed in their work they have to restart the construction process of the unit they were working on. Hora assembles units of 10 pieces each, and puts these modules together in a final assembly. When disturbed he only loses the last module of 10 pieces. Tempus assembles the whole watch from 100 individual elements. A disturbance means that he has to start all over again. It is easy to calculate that Tempus soon lags behind. This demonstrates the advantage of modularity in the evolution of system types. Koestler (1967) discussed the ‘holon’ concept and its double faced nature. He discusses a hierarchy of smaller (internal) systems ‘below’ and larger (external) systems ‘above’. Koestler uses the ‘holon’ to indicate that at any level in a hierarchy, a system can be recognized by a certain internal coherence. Due to this unity it can form the basis for between-holon interactions (Koestler 1967). Eigen and Schuster (1977) gained the Nobel prize for the ‘hypercycle’. A hypercyclic process is created when catalytic elements, join to form a second order cyclic process: the hypercyle. Details of the catalytic hypercycle are discussed in Eigen and Schuster (1977, 1978a, 1978b, 1979) and Kauffman (1993). Prigogine (1984) won a Nobel prize for far from equilibrium dynamics. Far from equilibrium the organisation in a system may increase. This is possible as long as the systems organisation is compensated for by the degradation of free energy and an increase in chaos in the universe as a whole. The recognition of the importance of ‘autopoiesis’ (Varela 1979). A central theme in the work of Varela (1979) is autopoiesis which he defines as ‘a network of processes ...’ that ‘....through their interactions and transformations continuously regenerate and realize the network...’. In this way, an autopoietic process is ‘closed in the sense that it is entirely specified by itself’. Autopoiesis is more demanding than the hypercycle, which does not define its own spatial limits. Varela shows deep insight in the abstract classification of system types when he states that ‘the only thing that defines the cell as a unity (as an individual) is its autopoiesis, and thus, the only restriction put on the existence of the cell is the maintenance of autopoiesis. All the rest can vary...’. Autopoiesis, however, gives little information about the structures capable of performing it. Laszlo (1994A) propagates a ‘General Evolution Theory (a GET)’. According to Laszlo (1994) the Grand Unifying Theory (GUT) or 'theory of everyting' that will allow the unification of forces is not a General Evolution Theory (GET). The reason is that a GUT is limited to elementary particles and does not explain the emergence of atoms, molecules, cells, multicellulars and organisms with brains. Kurzweil (1999) introduces The law of time and chaos. This law states that ‘In a process, the interval between salient events (that is, events that change the nature of the process, or significantly affect the future of the process) expands or contracts along with the amount of chaos’. High entropy and chaos (the cold-death of the universe) lead to less events. Low entropy and organisation lead to more events. Heylighen (1990) focuses in his work on different aspects of closure. The concept of closure implies that a set of elements can be submitted to a certain process with the following two effects: 1. each element is changed to a new state, 2. for every product of the process there exists a similar element in the original set (Heylighen 1989, 1990, 1991). In cybernetic systems the organisational closure implies that both the elements of a system and the processes they perform are recreated at least once after the process has completed one full step. The above ideas have brought major breakthroughs but have not led to the emergence of a unifying evolutionary hierarchy for particles. In fact, the literature about system hierarchy contains quite a few hierarchical rankings, but, as I will discuss, these are mostly too unspecific/abstract. High abstraction cripples even the most fundamental ideas in system hierarchy, such as the reductionistic worlds within worlds approach and the constructivistic viewpoint of lower level elements interacting to form higher level elements. The idea of worlds within worlds has also been referred to as Chinese boxes or Russian babushkas (i.e. Simon 1962, Koestler 1967, Lazslo 1972, 1996). The viewpoint of elements that via interactions create new elements is reflected for example in the work of Koestler (1967), Varela (1979), de Kruijff (1991), Jaros and Cloete (1987) and Cohen and Steward (1994). The problem with these and similar approaches is that they are so unspecific in the definition of their elements and transitions that it is impossible to use them for ranking natural systems in a strict way. As long as the types of elements and types of interactions are not specified in detail, many different ‘things’ can be regarded as elements, and many different types of ‘interactions’ can be regarded as creating new 'layers'. 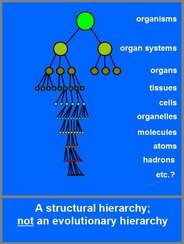 Koestler (1978) presents a ‘tree-like’ hierarchy representing the internal organization of (multicellular) organisms. Looking inside the organism, Koestler recognizes the following stages: organ systems, organs, tissues, cells, organelles, molecules and atoms, and finally sub-atomary particles. This range is constructed by analyzing how higher level elements consist of lower level ones. The first problem with such an approach is that it focuses on lower levels within existing ones. A cell, however, does not only contain atoms that are integrated in molecules that are part of organelles that are part of the cell. A cell also contains large numbers of individual molecules and atoms. How can these be ranked if they are not part of the hierarchy? The second problem is that, from the point of view of an evolutionary hierarchy, it is problematic that a ranking includes organs and organelles. These elements do not belong in an evolutionary hierarchy. Organelles could evolve only after the cell offered a selective environment for them. Similarly, nature did not start with creating organs, such as harts, livers, eyes, intestines, etc. to put them together to animals of all sorts. The evolution of organs became only relevant and possible after the first simple multicellular organisms had emerged in which organs could play a role. Also the inclusion of endosymbionts, such as mitochondria and chloroplasts, requires the presence of a host-cell as a first step. The theory of the 'cosmic onion' in principle shows the same top-down approach as that of Koestler, but focuses on the abiotic world. An interpretation of the 'cosmic onion' by Close (1983), starts with the earth, consisting of molecules and atoms, consisting of hadrons and electrons, whilst the hadrons consist of quarks. A broader interpretation could also have included the universe, consisting of galaxies, solar systems, stars, planets such as the Earth, etc. Also this interpretation has a range of flaws for the present purpose. One, it does not explicitly include particles (including organisms). Two, it uses different types of rule for explaining any next layer. Galaxies, for example, are not constructed from solar systems in the same way as atoms are constructed from hadrons and electrons. Yet both the electron shell and the cell membrane owe their construction to a closure that follows immediatly after the last preceding closure. ‘First, in the multitude of things comprising the world, an examination of their degree of complexity enables us to distinguish and separate those which may be called ‘true natural units’, the ones that really matter, from the accidental pseudo-units, which are unimportant. The atom, the molecule, the cell and the living being are true units because they are both formed and centered, whereas a drop of water, a heap of sand, the earth, the sun, the stars in general, whatever their multiplicity of elaborateness of their structure, seem to possess no organization, no ‘centricity’. However imposing their extent they are false units, aggregates arranged more or less in order of density. Secondly, the coefficient of complexity further enables us to establish, among the natural units which it has helped us to ‘identify’ and isolate, a system of classification that is no less natural and universal’ (ES V, p. 137; 1946). As Teilhard de Chardin shaped his ideas before the development of ideas about hypercycles and closure, it is not surprising that he had difficulties defining centeredness as a measure for complexity. An interesting peculiarity of his wrestling with the concept of centeredness is the fact that Teilhard de Chardin associated centeredness with consciousness, due to which for him there was little difference between discussing the centeredness of an atom or the consciousness of it. Yet, with the concept of closure at hand, it is clear that consciousness better be considered as a special consequence of neural closure. Consciousness exists only at the level of organisms with hypercyclic neural networks. At any lower level, closure still exists, but has lost its relationship with consciousness. Being a pious person Teilhard de Chardin also included in his hierarchy society and an imaginary unity between systems and god, ‘point omega’. A stricter system approach could have shown him that societies are false units, because, even though they show organization, they possess this property not as the first-next possibility. Despite these inconsistencies, I advocate that the idea of centro-complexity, the notion of true and false units and the hierarchical ranking of systems according to (centro-)complexity demonstrate the visionary insight of Teilhard de Chardin in the abstract nature of the evolution of system types. It is surprising that none of the hierarchies in the literature offers a more or less complete, systematic way for creating an evolutionary ranking of particles Does this mean that a general theory has to be considered as a fata morgana that forever will stay a few mental miles ahead of us? Of course this is a personal matter, but I think an answer can be found by paying attention to the following 3 points. 1. Thermodynamics and stability. A general approach should be in full accordance with thermodynamic laws but not be distracted by thermodynamic justification from its main theme: hierarchy. No systems in our universe violate thermodynamics on a large scale and for a long time, or when they do, any increase in internal organisation is compensated by an equal or bigger external increase in disorder. Since no deviations have ever been demonstrated from this rule, it can be considered a hypothetical exercise to demand proof that any next-level natural system does not violate the laws of thermodynamics. A special consequence of this reasoning is that complexity apparently represents a thermodynamically advantageous state, at least under certain circumstances. Otherwise, nature had never been able to repeatedly produce stable complex systems from less complex elements. Another consequence is that, as long as we limit a general system hierarchy to systems that already exist in our universe, we may take the thermodynamic justification for granted and focus on structural aspects of complexity instead. Many systems play no significant role in the evolution of system types. The reason is that systems have been selected away, that are unstable as the result of a problematic internal organisation or as the result of disintegrating interactions with the environment. Only those systems prevail in the evolution of system types that combine an easy production with a long enough lifetime. This is for example the reason why hydrogen is so abundant in the universe or why the light and easily formed pions convey the force between hadrons in the atomary nucleus. 2 Closure. A general approach should focus on closure because this offers the most important mechanism behind the creation of higher levels as well as the simplest measure for complexity. The circular interaction pattern of closure, the ‘snake swallowing its own tail’, is of immense importance to hierarchy theory, because it creates a clear delimitation of the functional and/or structural boundaries of the emerging, new system type (i.e. Heylighen 1990, Holland 1998, Chandler and Van de Vijver 2000). Closure may be functional or structural. Functional closure implies a closed cycle of transformation processes performed by the elements, such as in an autocatalytic set of enzymes. It does not necessarily create a physical boundary. Structural closure always implies the creation of a physical system boundary. Such a boundary is necessary if we want to recognise the system as a ‘unit’ or an ‘individual’. For example, without the structural closure of a cell membrane, the enzymes of an autocatalytic set would float freely around in their chemical environment. Nothing would preclude the enzymes from drifting apart or mixing with other sets. Clearly, a spatially ill-defined system cannot be used as the basis for a system hierarchy. The lesson that we learn from this is that the construction of a hierarchy of system types requires physical units with clear spatial limits. 3 First-next possible closure. The search for a general approach requires a limited objective. Here I advocate a focus on systems that evolve by means of first-next possible closure. For the operator hierarchy only those closures are relevant that occur as the first-next possibility. I have named such closures ‘first-next possible closures’. By definition there cannot exist a closure state in between of a system and its one-higher-level successor system if the latter shows first-next possible closure. Due to this property, first-next possible closure can be used to create a strict hierarchy in which no system type can be left out or be inserted. The systems that are related via a long chain of first-next closures form a large pedigree defining a strictly limited set of system types. This set of system types forms the ‘universe of discourse’ for the present proposal for a general theory about the evolution of system types. How the latter three attention points have resulted in the creation of a strict evolutionary hierarchy of system types is explained in this website.